Looking to mix it up a little? Have some fabric leftovers that need using up? Want a summer project that doesn't stick to your sticky sweaty fingers the way wool yarn does? 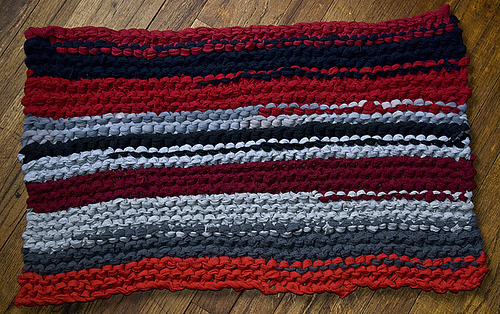 Try knitting up a rug with fabric strips! How do you cut the strips? If you are using a woven cotton fabric, it's easy: just nick the edge of the fabric with your scissors and then tear. Aim for strips that are between ½ an 1" across. How do you join the strips? Rugmaker's Homestead has a comprehensive collection of all the various methods for joining strips. That sounds like too much work. It depends on how wide your fabric strips are, and how stiff you want your rug to be… start with at least a size 19. Maybe bigger. Lion Brand has some giant knitting needles you can buy at big box craft stores in the #36 range. Most people start with a rectangular garter stitch rug. Cast on as many stitches as you can, then garter stitch away. If you want to get fancier, or you want a rug that is wider than the number of stitches you can cast onto your needles, you can knit strips, and sew them together with a contrasting color. It has occurred to me to try something like Frankie Brown's Ten Stitch Blanket with rag strips, but back-and-forth instead of in a spiral. However, I'm not sure if it's feasible to be picking up stitches and decreasing stitches on each row when you're knitting with something as non-compliant as fabric strips. Food for thought, though!